Taxonomy is a branch of biological science involved with classifying organisms based on characteristics they share in common. Using morphological, behavioural, genetic and biochemical observations, taxonomists identify, describe and arrange species into a hierarchical system of groups. Because taxonomists also identify and name organisms, it could be argued that Adam was the first to perform this aspect of taxonomy. The Linnean Taxonomic Hierarchy, which is still used today, was developed in the 18th century by Carolus Linnaeus. As Carolus Linnaeus's work Systema Naturae was published over 100 years before Charles Darwin published his theory, his writings do not mention or makes any references to evolution. Linnaeus was a deeply religious man, believing his work "would reveal the Divine order of God's creation". Many new taxonomic groups have been added since Linnaeus first developed the modern system, and today evolutionary relationships dominate taxonomy. Taxonomy originally involved grouping organism based on the easily observable characteristics they share in common (morphology). All organisms assigned to a particular group possess the same features. Each group is then subdivided so as to further distinguish its members based on their differences. This hierarchy of groups and subgroups provides a systematic method for classifying and naming organisms ranging from very general similarities to ever increasingly detailed. Since the theory of evolution gained widespread acceptance among scientist, a branch of taxonomy known as cladistics has become increasingly popular. Cladistics assumes common descent, and arranges organisms into a tree of ancestral descent based on the proportion of characteristics that organisms share. Both evolutionary assumptions and biochemical examinations continue to force modification on accepted taxonomic names and arrangements. The taxonomic system is hierarchical. All of the organisms in a particular group (i.e. Kingdom) possess certain characteristics that unite them together and distinguish them from other groups. Each group can likewise contain several subgroups, which in turn are often divided into even smaller groups. For example, within each Kingdom there are usually several groups called Phyla. These Phyla all share some broad characteristics in common, placing them within the same Kingdom, but they can be distinguished from each other by more subtle variations. And within each Phylum, there are usually several Classes that are united by characteristics into the same Phylum, but also distinct in other ways allowing them to be group separately. The species is the smallest grouping of organisms, although there can be many varieties or subspecies. It should also be noted that most of the levels shown in the hierarchy above have been further subdivided or elevated. Common prefixes used with the root taxonomy designations include: sub, infra, super, supra, etc. There are three domains: Archaea, Bacteria, and Eukarya. Archaea and Bacteria are prokaryotes, meaning they are single celled and do not have a membrane-bounded nucleus. Archaea tend to live in extreme environments, being able to tolerate high temperature, high salt concentrations, low oxygen concentrations, or highly acidic or basic environments. Eukaryotic cells have membrane-bound nuclei and organelles. 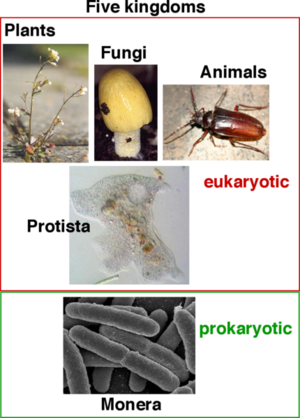 Eukaryotic organisms may be unicellular or multicellular. The domain level was proposed by Carl Woese in 1990. In 1977, Woese had discovered that a group of methane-producing microbes had different ribosomal RNA sequences than other bacteria and eukaryotes. These microbes were classified as the archaea. 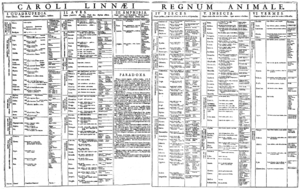 Table of the Animal Kingdom (Regnum Animale) from Carolus Linnaeus's first edition (1735) of Systema Naturae. Until recently, The Kingdom level was the broadest grouping of organisms, of which there were 5 generally recognized. For many textbooks, these 5 will still be seen: Animalia, Plantae, Fungi, Protista, and Monera. More recently Monera was divided into Eubacteria and Archaea (formerly known as Archaebacteria), rendering six kingdoms. Subsequently, Archaea and Eubactera (now Bacteria) were elevated along with Eukaryota to the level of Domains. In the following table, the 6 Kingdom system is displayed, although individual pages will identify the latter two as domains. The specific scientific name given to any organism is a binomial comprised of the names of the genus and species to which the individual belongs. For example, the Gray Wolf belongs to the Genus-Canis and the Species-Lupas, and therefore, its scientific name is Canis lupas. Species in the same genus can never have the same species-name, but species belonging to different genera can share species-name. An example is Lathyrus sativus and Crocus sativus. The name of the genus is always written with the first letter capitalized, while the species-name is written in small caps. Furthermore the subspecies is represented by a trinomial, which contains the species binomial plus the specific subspecies name. Baraminology is a creation biology discipline that studies of the ancestry of life on Earth (biosystematics). It draws from the presupposition that God created many kinds of organisms as described in the Biblical book of Genesis, and is an effort to use scientific means to determine which organisms separate kinds (baramin), and which are related. Creationist biosystematics enables us to more clearly view and understand relationships that might not be visible from a naturalistic perspective. Most importantly, it provides another way for us to know the Creator. The Baraminology Study Group (BSG) has been instrumental in this area of research. The group is involved to further the development and research of this theoretical framework in creation biology within a forum of leading creation scientists in the relevant fields. Cladistics is a classification system for species which seeks to determine how different species are related. Evolutionary cladistics is based on the hypothesis of common descent, or the belief that all life on Earth is related. Creationist cladistics, on the other hand, is based on the hypothesis of created kinds, or the idea that all life on Earth was created by God fully formed and functional, so that some forms of life are related, but others are not. One variation of systematics is known as phylogenetic systematics (from the Greek words for phylon which means race and genetics which means birth). Instead of relying only upon morphology, cladists also use fossil evidence, genetic, and biochemical analysis to construct treelike diagrams called "cladograms". Taxonomy is different than cladistics. Cladistics is the classification of species by ancestry. Taxonomy, on the other hand, is the classification of species by their characteristics, but makes no claim to their ancestry. While creationists and evolutionists disagree fundamentally on cladistics, they agree for the most part on taxonomy. Historically the common names of many animals can be credited to the first man - Adam. The book of Genesis chapter 2 tells us that God brought every bird and beast of the field to Adam so he could name them. Arguably many of the common names still used today are derived from this ancient nomenclature. ↑ What is Taxonomy? by the Convention on Biological Diversity. Accessed May 29, 2011. ↑ About: Carl Woese. Carl R. Woese Institute for Genomic Biology. University of Illinois. Accessed 19 May 2016. ↑ 4.0 4.1 Waggoner, Ben, and Speer, Brian. Archaea: Systematics. University of California Museum of Paleontology. 20 April 2001. Accessed 19 May 2016. Plant Template Use these templates for creating a Taxonomy box on pages that describe particular organisms or taxa. Taxobox Taxobox suitable for customization for specific applications. The Taxonomy Project By Scott Federhen ; Created: October 9, 2002. This page was last modified on 28 May 2017, at 18:50.